Late last year Crystal and Scott tied the knot at the beautiful Maleny Manor. The atmosphere was bright and uplifting with the stunning hinterland and ocean views. The ceremony was both graceful and intimate surrounded by close family and friends. After the ceremony champaign and strawberries were served outside followed by laughter and dancing that opened up the night ahead. 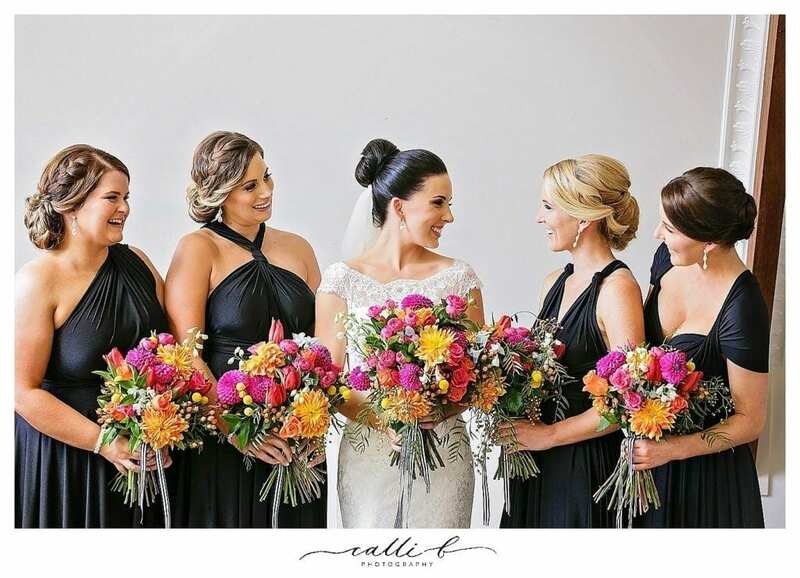 Crystal’s bridesmaids wore black flowing dresses that looked effective against the bright pink and yellow bouquets that were thoughtfully placed throughout the venue. Crystal looked angelic in her Skyler gown by Augusta Jones, that fell off her shoulders gracefully, finished in french floral lace that complimented her figure. She paired her dress with bright pink heels that matched her flowers with an elegant sleek bun that completed her timeless and classic attire. The night ended on a buzz, with fireworks dancing above in the sky as Crystal and Scott began their new chapter in their lives.